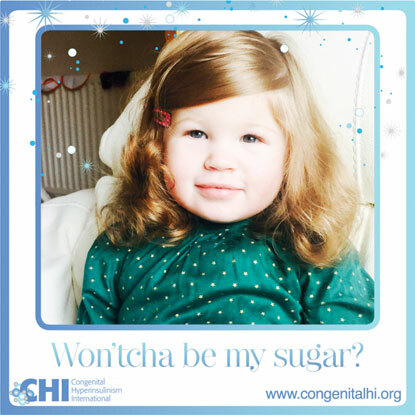 Congenital Hyperinsulinism International (CHI) – dedicated to improving the lives of people born with the rare condition, congenital hyperinsulinism (HI), has launched the Be My Sugar campaign leading up to the 2016 Rare Disease Day. 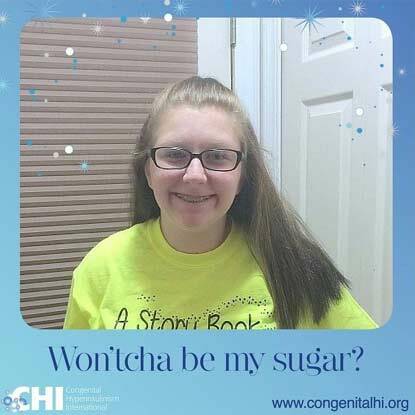 Here you will find the CHI Be My Sugar Gallery where you will find the beautiful faces of our Sugar Babies and you will learn about their experiences and lives in the words of their parents. 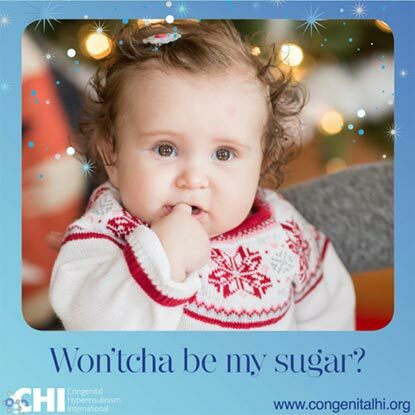 Babies born with HI, Sugar Babies, overproduce insulin, which causes low blood sugar. Prolonged low blood sugar can cause brain damage and death. The terrible consequences of prolonged hypoglycemia are 100% preventable if Sugar Babies are diagnosed and treated in a timely manner. Families with HI babies also need long-term on-going support as treatment is complicated, constant, and prolonged. 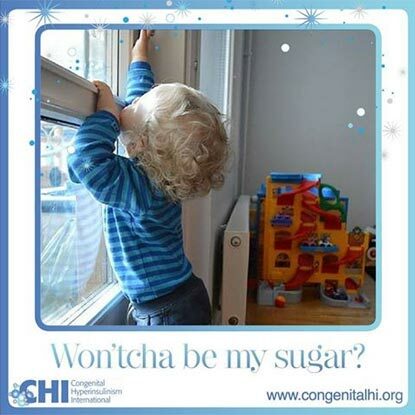 Be My Sugar is a call to action to support the needs of people born with this rare condition because sugar is life for Sugar Babies. 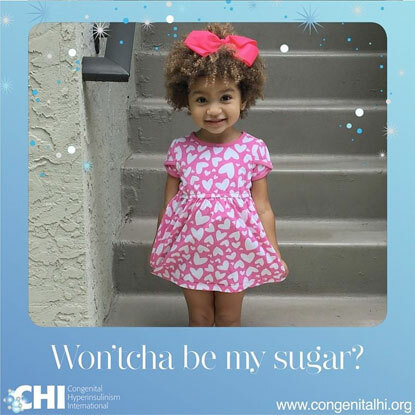 Each day leading up to Rare Disease Day, CHI has blitzed social media with a photo of a beautiful Sugar Baby in a Be My Sugar frame, and shared a story or a message from an HI family somewhere in the world. HI Families from 39 countries are a part of the CHI network. 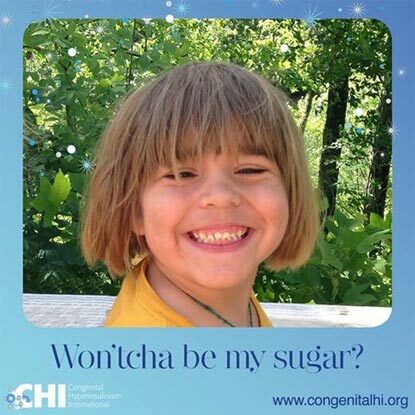 The Be My Sugar campaign has been created to shine the spotlight on this rare condition to save lives and prevent brain damage. Prolonged hypoglycemia is the leading cause of preventable brain damage. Please note: we’ve moved some of the profiles here to our HIstories section; please check there for more stories about our Sugar Babies and their life experiences. This was my son Lewis. We discovered at birth that he had hyperinsulinism. 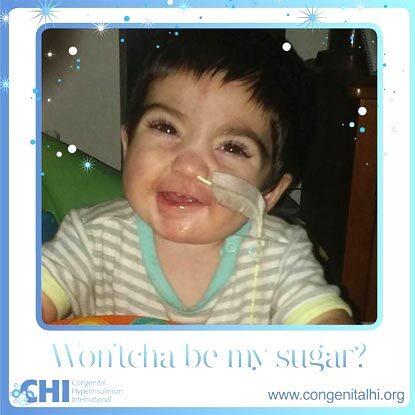 He stopped breathing shortly after he was born and his sugar was so low it wouldn’t register. He came home from the hospital after 3 week and was taking diazoxide and chlorothiazide. After a year he was weaned off the medications and had regular check-ups and was discharged from clinic just 2 weeks ago. He is 7 now and shows no symptoms. This is my baby girl Dhara. She is now 2. She was born by C-section. When she was born, she was very big and swollen, but nobody seemed to notice anything! Later, on the day she was born, I noticed her making noises and sweating, and I asked a nurse if this was normal. The nurse kept an eye on her, and a few hours later she was lying there lifeless, and she could barely open her eyes, so I ran to a get a nurse. The nurse checked her blood sugar and it was 0.2 mmol/. The nurses panicked and took her to the ICU unit. She stayed until she was 5 months old. Many tests were run on Dhara and they tried many medications. Finally, she stabilized. We were told she had one of worst cases they had seen in Glasgow, In 4 years. 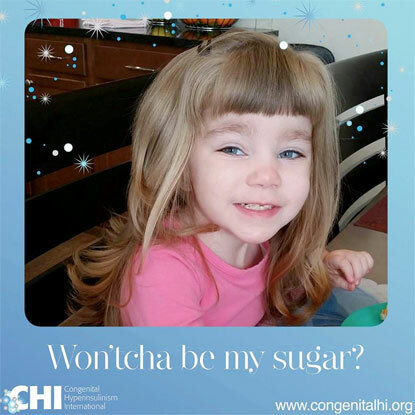 As a result of hyperinsulinism, she has had numerous seizures. She had one a few months ago. As she gets older, she isn’t a great eater. She takes diazoxide three times a day, and she has a subcutaneous infusion of octreotide through an insulin pump. She also has Maxijul added to her drink. She is now under the care of the Royal Manchester Children’s Hospital. They are now trying her on a new injection that is hopefully going to mean that after sometime, she can have the pump removed. If that doesn’t work, she might need an operation. She is such a bright and happy wee girl. You would never know what she goes through on a daily basis. It has been a hard two years but I am very proud of her. Fingers crossed that she grows out of this or that an operation will make it easier to manage. This our sugar baby Sameer Rai Kaul. He is 5 years old. When Sameer was born he stopped breathing and was rushed to the NICU and they had discovered his blood sugar had dropped dangerously low. 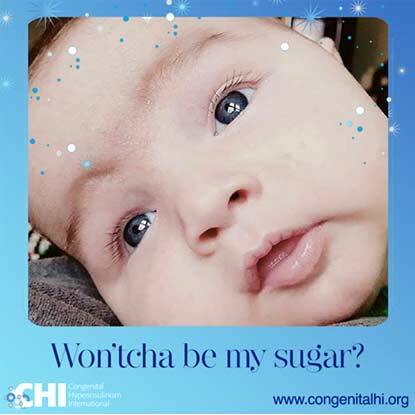 After several days in the NICU he received continuous IV feeding, special formula and numerous blood draws they diagnosed him with hypoglycemia. They didn’t know the cause of this and began diazoxide treatment for two months when he returned home. After these initial 2 months he began weaning off the diazoxide and was able to maintain sugars in the 70-80s. Sameer has had no other issues with this disease and is a healthy almost 5 year old. This is my 8 year old son, Kevin Jr. 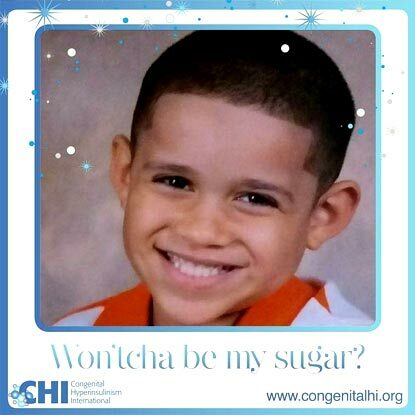 He was born with hyperinsulinism. He is an outgoing, smart, caring, loving, handsome young man. He loves basketball, baseball, his 2 puppies, and his whole family. Last school year during spring break, he got type 1 diabetes added to what he already had. My husband and I love him so much and are so proud of him. He will be 9 on June 9. Finn decided he needed to be born about 6 weeks early, and we soon found out why: He had a tumor growing in his liver that needed to be removed ASAP. 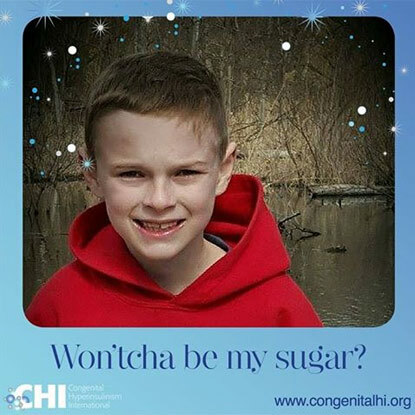 His sugars didn’t even register at birth, but the tumor consumed everyone’s immediate attention and so he was put on dextrose to keep them up until the tumor was removed. We lived in the Chapel Hill Children’s NICU and slept at the nearby Ronald McDonald house as he healed from the removal of the thankfully benign mass on half his liver. Once he recovered, the research into his low sugars began. The doctors suggested all kinds of scary diseases and syndromes but finally, after contacting CHOP, nailed it down to hyperinsulinism. We were sent home with an NG tube and a regimen of diazoxide, feedings and continuous dextrose. His sugars remained low, however, so after a stay in the closest hospital with a pediatric endocrinologist he was flown to CHOP. There we learned that his case was a rare type of the already rare disease. After much deliberation he had a G-tube placed and after recovery and regulation we were sent home with a new regimen and a lot more knowledge. He’s had ups and downs since then, but to play and talk with him you wouldn’t know he has any problems. He’s full-speed-ahead, and wearing his feeding pump backpack has only made him stronger; he even helps daddy move furniture! His “tubie”, “beeper” (continuous glucose monitor) and glucometer have always just been a part of his life and he takes it all in stride. He’s happy to show his tube to his friends (and completely healthy sister) and tell them about it. He is such a blessing and joy to us! 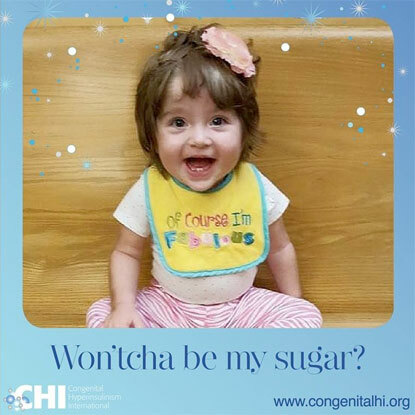 Loralye was born full term, with no complications and she did not have critically low glucose levels. However, just weeks after her first birthday, she had a horrifying seizure and became unresponsive while rushed to the Emergency Room. Her glucose level was a mere 13 and I was told my daughter MUST HAVE overdosed on diabetic medications. My “Peanut” was limp, sweaty, clammy and shaky, yet they wanted to send her home!? 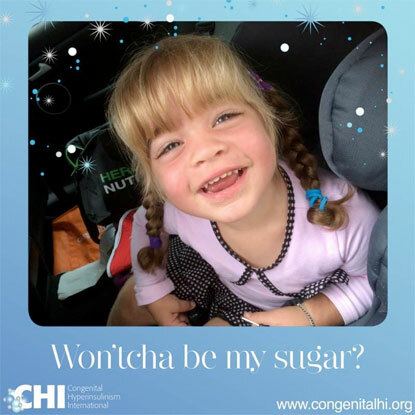 I insisted she be admitted for observation and after 24 hours they confirmed she had NOT overdosed and 24 hours later, she was diagnosed with congenital hyperinsulinism, and we later learned it was caused by an ABCC8 gene mutation. In an instant My life revolved around numbers, nutrition and needles; all for a toddler, whose favorite word was, NO! Loralye tried Diazoxide, Diaril and even raw, gritty cornstarch, but nothing seemed to work to stabilize her glucose. Dr Thornton needed fasting studies, labs and scans to devise a plan of care. Peanut and I stayed busy w ultrasounds, PET scans, labs, poked every 2 hours, multiple IVs and PICC lines. Then she had surgery, which lead to an epidural, catheter, more IV tubes, a feeding tube and a lot of pain. But it was all worth it when she was deemed CURED about a year later! Sending out a BIG hello to all from sugar baby, Nate & I. Nate was born with Pierre Robins Sequence, but there always seemed to be something else lurking in the background that we couldn’t put our finger on. 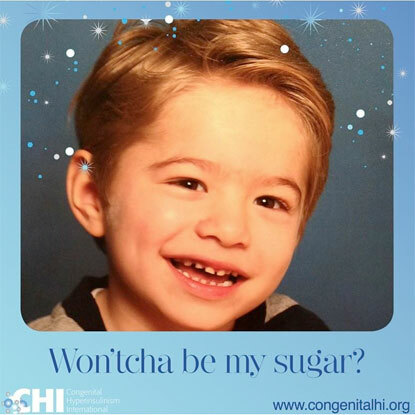 At 6 months old Nate suffered a convulsive seizure, as a result of extremely low blood sugar… And that was it. One minute I was making an early morning Sunday coffee and the next we found ourselves initiated into the world of hyperinsulinism (HI). It’s been a steep learning curve, so far. Some days are FABULOUS. Other days the term ‘day’ itself seems too long a time frame, too far away to achieve, so we break it down into hours, sometimes minutes. Our lives are ruled by the clock, checking blood sugar levels, feeds & meds. Yet through all the ups and downs there is one thing that has remained constant and that is my beautiful little Nate. He is the same courageous, loving and happy little boy he was before HI, and his strength and cheeky character continue to blossom in spite of it. No matter how unwell he is, you can guarantee Nate will be smiling, his wonderfully contagious smile, to everyone in his view. I couldn’t be prouder of my Sugar Baby and I’m honored to have been chosen to be his mum. 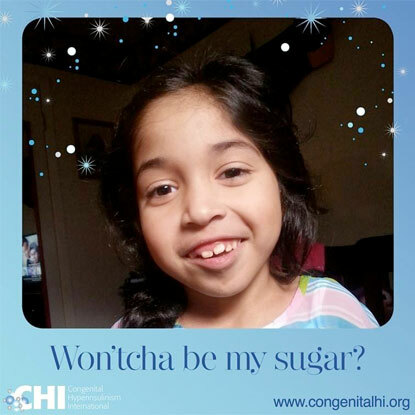 My sugar baby is Julieta Joy, she was born with an 18 blood sugar last summer. We were lucky enough that they checked her blood sugar as soon as she was born because she was unresponsive. She was diagnosed with hyperinsulinism when she was 5 days old, and she struggled in the NICU for about 3 months until we could stabilize her sugars and bring her home. She currently eats high caloric formula through a g-tube every three hours and has to eat continuously overnight for 11 hours to maintain stable sugars. She also gets two injections twice a day. She is now 7 months old and is growing and meeting her milestones. We hope that she did not have any brain damage due to her low blood sugars early on. She is the perfect baby, and transmits nothing but love to all around her. 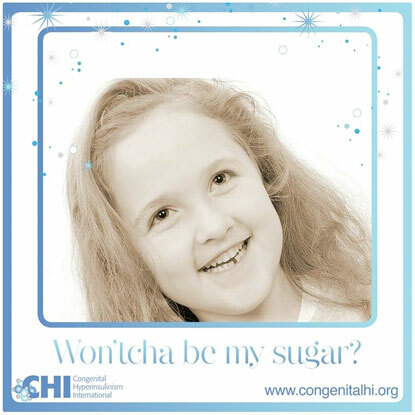 Her HI is non-genetic so we hope that she will someday outgrow this very difficult rare disease. This is Jeremiah. He is five years old and has no known mutation. He was diagnosed at 11 months old. Only on the 4th visit to the emergency room, after having is 4th seizure, was he diagnosed. When I brought him to the emergency room, after his second seizure, we were told he was just having night terrors. Then he was diagnosed with epilepsy, and finally with HI. His condition is managed with diazoxide and diet. Our son Aapo was born in February 2015 in Helsinki (Finland). 34 hours after birth his low blood sugar was noticed – he spent three weeks at the NICU in Helsinki and was diagnosed with hyperinsulinism. He has a mutation in the gene HNF4a1 and is diazoxide responsive – in September 2015 he was weaned off and is now cured! His gene mutation may cause diabetes later in his life. We are very grateful for all the great support we have received from the HI family during our journey and we hope our story will encourage other HI parents. 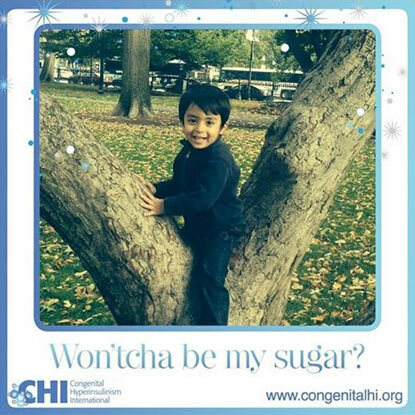 Ezra was diagnosed with HI at the age of 5 months after a seizure. Although initially we thought he had focal disease, during surgery we discovered it was actually diffuse. He is currently being treated with octreotide injections during the day and overnight dextrose while he sleeps. He is a sweet and active 14 month old who is adored by his older siblings. We are so thankful he is a part of our family. This is Kieran. 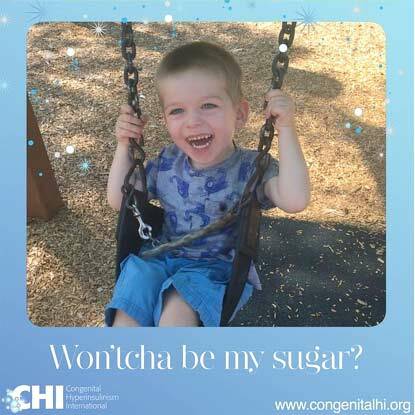 He was diagnosed with CHI after a hypoglycemic seizure. He was hospitalized for two weeks at the Children’s Hospital of Wisconsin until he was diagnosed. He has a mutation in UCP2 and is responsive to diazoxide. He still struggles with low blood sugars and the affects of spending the first 12 months of his life with low sugar, but he is stubborn and determined not to let anything slow him down! 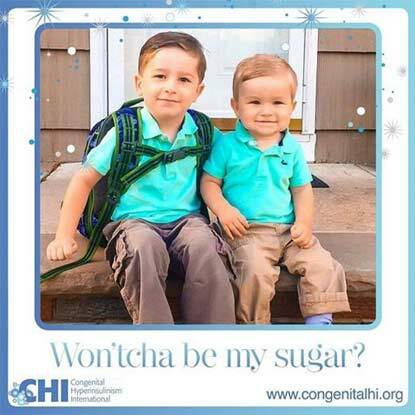 We are from New Jersey and both our sons were born with transient hyperinsulinism. They were treated at the Children’s Hospital of Philadelphia (CHOP) where they both were put on a course of diazoxide and diruil. Both resolved after 5 months of treatment. Neither child carries the genes for HI, nor do my husband and I. I did not have gestational diabetes or hypothyroidism. James, my oldest, was an emergency C-section and needed to be resuscitated at birth. The nurse who took care of him decided to check his sugar, so he was monitored since birth – we feel very lucky about that. 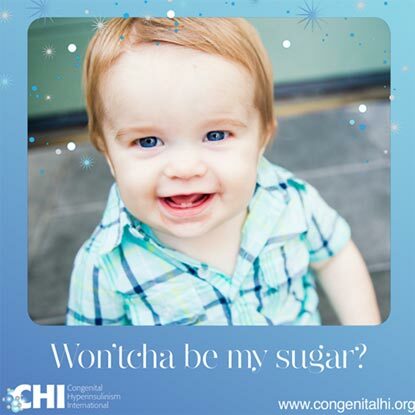 Doctors at our local NICU could not figure out why his sugar wasn’t resolving so after a few weeks we were transferred to CHOP where he was diagnosed and treated for HI. When I became pregnant with Matthew we were so worried he would have it too, but were assured he wouldn’t because there was no genetic cause. But, to be safe, we would check him when he was born. Unfortunately he was born with transient HI as well. 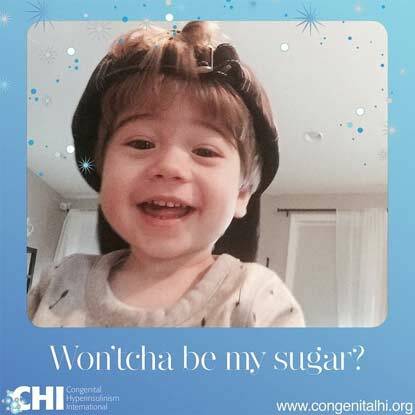 CHOP’s first case of sibling transient hyperinsulinism. It was a rough start for both our boys but we are grateful that they recovered and are currently doing very well. Thank you for letting us share our story. This is our 19 month old sugar baby, Leo. 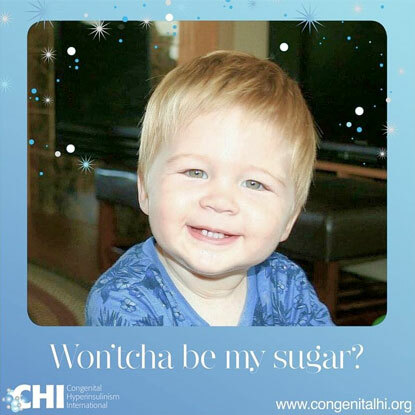 At 4 months old, he had a seizure and less than 3 days later, he was given the diagnosis of hyperinsulinism. We are very fortunate that he responds well to diazoxide and on “good” days doesn’t require more than 2 or 3 blood sugar checks. He has a mutation on the UPC2 gene, inherited from his father, who is non-HI. Apparently, there are less than 10 reported UPC2 gene mutations worldwide and the particular region of their mutation has never been reported before. We are traveling to CHOP in the very near future so Leo’s father can participate in a study as it relates to the UPC2 gene. We are excited for the opportunity to learn more and to contribute to the ongoing research regarding this very rare disease. Leo is a happy, charming, silly little boy who takes his medicine like a champ and barely flinches during his blood sugar checks. He is a brave little guy who never ceases to amaze us each and every day. There have been some dark days in dealing with this disease, especially in the early days and it can be challenging when he’s not well or is being a picky toddler….but we feel truly blessed. We also feel incredibly grateful and blessed for the CHI Parents Forum; it is an incredible thing to be able to connect with other parents, worldwide, who can relate, understand and show support. 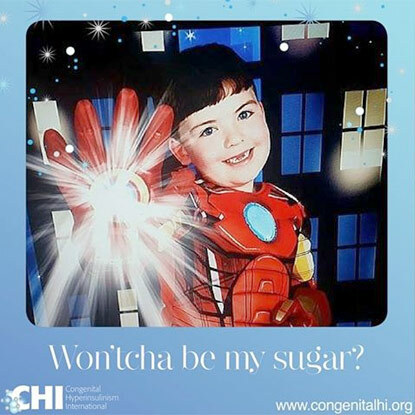 My name is Ashlee and I was diagnosed with HIHA when I was about 14 months old. I have always had to check my blood sugar many times each day, watch the amount of protein I eat and take a lot of medicine. It is really frustrating sometimes because I crave all of the foods that I should not eat. My parents and I do a lot to advocate and help others with this disease. I have even tried new medicines in hopes of it helping manage my blood sugars. I think that living with this disease has helped me become really understanding and empathetic about people dealing with rare diseases. I want to be a nurse and next year, when I am in 11th grade, I will be starting an early college program to start my nursing program prep. I told my mom that I dream of being a pediatric nurse for either CHOP or Cook Children’s Hospital and working in their hyperinsulinism clinics. They think that is a great goal for me to have! This is beautiful Fatima. She lives in Benghazi, Libya where she lives with her loving family. 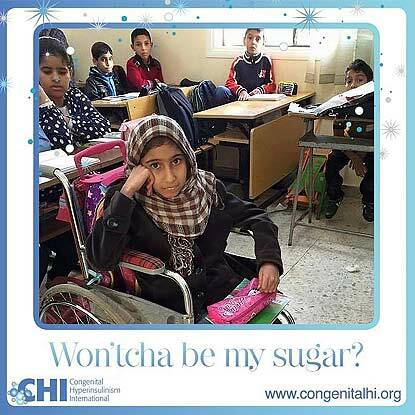 Fatima is in a wheelchair because she cannot walk, the result of prolonged untreated hypoglycemia before she was diagnosed with hyperinsulinism hyperammonemia syndrome. Also, due to hypoglycemia, Fatima has trouble with her jaw and esophagus. Fatima wishes for a cure for hyperinsulinism hyperammonemia syndrome. Fatima loves to learn, reading and writing. Hi everyone! This is my son Asher! We are from New Jersey! 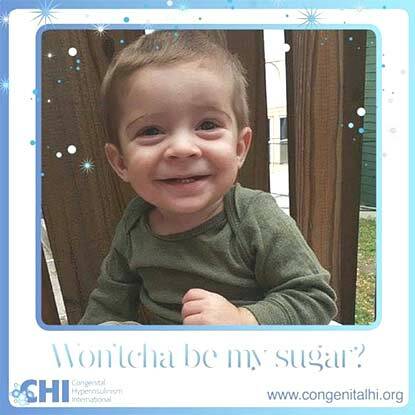 Asher was transported to the Children’s Hospital of Philadelphia where he was diagnosed with KATP defect with Diffuse Congenital Hyperinsulinism and Beckwith Wiedemann Syndrome, at only 2 days old! He had a near-total pancreatectomy (98%), appendectomy, and a fair share of tests done during my his month of life. This has been quite an adventure for us. I cannot wait to see what the future holds for this little guy! He is already doing amazing things. He is one of the happiest babies that I know. I am very thankful for CHI, bringing all of these families together. Asher and I have made some wonderful friends! We wish all of the best to all of our fellow HI babies and families! Paula is from Catalonia in Spain, near Barcelona. She has two mutations in the gene ABCC8. She has has taken diazoxide since she was two days old, although she has only a partial response to it. We’ve had four years of very hard times, but we have also learned that the brightness in her eyes, is the biggest strength. From her diagnosis, we have discovered many new words such as hyperinsulinism, dextrose infusion, diazoxide, ocreotide, pancreatectomy, gastrostomy, PET scan… although none of us wanted to discover them. But we’re very thankful to the CHI family, it’s great to have friends that know exactly what you’re feeling, or what you’re worrying about, no matter where they live. Hi, I am Maxwell! 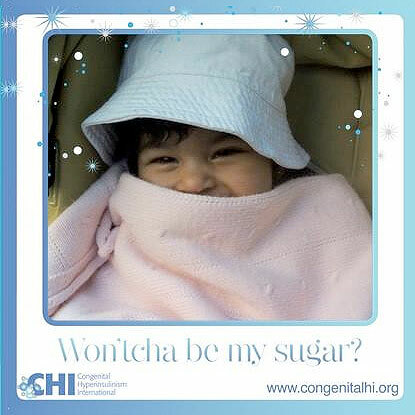 I will be two years old in May, and I have hyperinsulinism/hyperammonemia (HIHA.) My blood sugars are managed by a high diazoxide dose and diet. I like to keep my family on their toes because my blood sugar drops when I’m teething and when I get sick, which has led to some extra hospitalizations. I have such a happy, easy going personality. I love keeping up with my big brother and snuggling my dog. 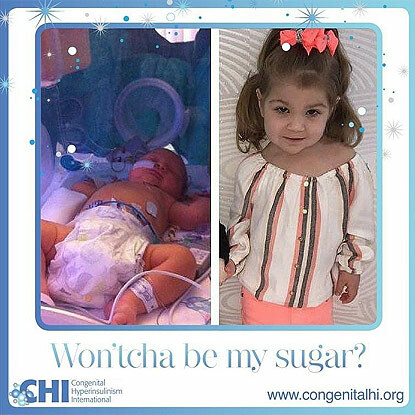 Penelope was born with meconium aspiration that required ECMO treatment and during recovery we discovered she had ‘blood sugar issues,’ that turned out to be congenital hyperinsulinism (HI). She responded well to diazoxide and it later transpired after further testing that her HI was the result of Beckwith Weidemann syndrome. It is particularly difficult for babies with both as it is quite a small cross section and can be overwhelming dealing with not one, but two rare diseases! Penelope is currently being trialed off diazoxide and is doing great so far! I found out something was going to be wrong with Olivia two weeks before I had her, but nobody knew what. 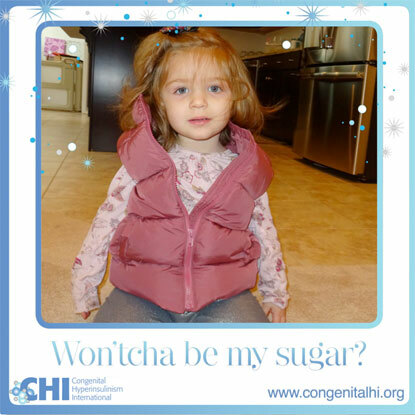 On December 18th, 2013 Olivia was born with a blood sugar of 4. Since then I have literally felt my heart break, but at the same since, my heart has never felt so much joy. In 2 years, Olivia has stopped breathing on me more times than any parent should have to experience. I have seen the worst. 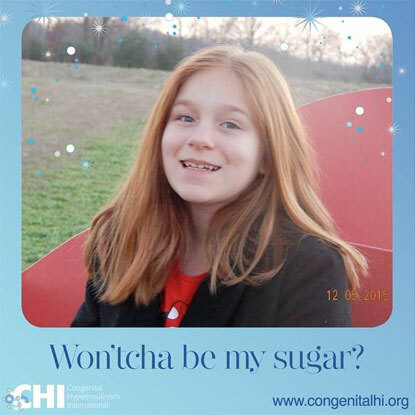 Olivia had 98% of her pancreas removed in January 2015. After her surgery, Olivia had problems with pain and keeping her airway open. I spent a lot of days in the PICU in Texas. I knew this is what rock bottom felt like. On our 3rd day in the PICU the nurses started shutting the curtains all around us, but ours had a little sliver still open, and I saw that another little one did not made it (for different reasons), yet I was still holding Olivia, and she was fighting. I knew from that day, I need to keep fighting for this little lady, because she has hit rock bottom, and has kept fighting. Olivia has two rare diseases hyperinslinism, and Kabuki, neither one of which, I would wish upon someone. Olivia still suffers from HI even after the surgery. Olivia still take meds for low blood sugar, she still needs her blood sugars checked throughout the day. Olivia has to eat every 3 hours, and still needs to be on continuous dextrose at night. Now Olivia is almost 26 months old, she is walking, she is eating on her own, and she is trying to form words. Alyssa is our 9 year old sugar baby! She was diagnosed at 10 months old and has been on the medication, diazoxide, since then. Alyssa was named 2015 Salem County Children’s Miracle Network Ambassador. 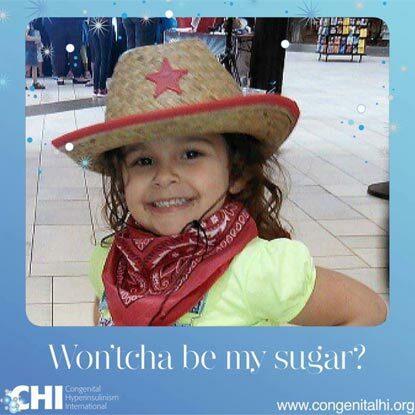 She has ridden in a few parades raising awareness for congenital hyperinsulinism. Alyssa is such a brave, strong little girl and she lights up our life with her beautiful smile! This is my sugar baby Evelyn. 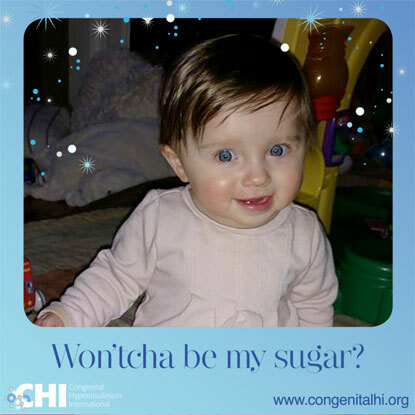 She spent the first few weeks of her life dealing with low blood sugars in the NICU, which led to her diagnosis of hyperinsulinism. Evelyn also had aspiration issues which led to another harrowing hospitalization where we learned she could not swallow thin liquids. An NG tube was placed, and she was put on oxygen in order for her lungs to heal. The issues continued to add up, which led the team of doctors to suggest genetic testing. 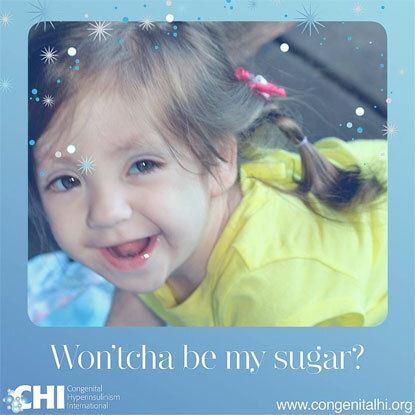 We wouldn’t learn of her mosaic Turner syndrome until she was 4 months old. At the time of her diagnosis, her geneticist could only find one other documented case of hyperinsulinism and mosaic turner syndrome. The continued feeding difficulties, and overnight feeds needed for blood sugar management led to a g-tube being placed at 4 months old. Evelyn is managing her HI well on diazoxide and g-tube feeds. Despite all of her difficulties, she is alive and thriving. She is a happy, smart, energetic, loving 3 year old. This is Gracie from Lubbock TX. She is now 6 years old and still dealing with developmental delays and challenges. She was diagnosed at 4 months old. Her symptoms appeared hours after birth but the nursery mistook it for transitional diabetes and sent us home … my only wish is for hospitals to stop discharging any infant showing any kind of signs of hypoglycemia, even if it could only be transitional diabetes … keeping her longer in the hospital could have meant a chance at a normal life … comparing Gracie’s development to her younger sister’s shows how much of a deficit Grace has … early diagnosis could mean less brain damage, and seizure history or epilepsy would be less likely … ALL BABIES DESERVE THAT MUCH! This is my sugar baby..Ava had a rough start in life but she is now nearly 7 years old and managed solely by diet and her pump at night. We are so proud of the way Ava handles her condition every day.She is amazing and we love her very much! Joslyn Gabriella is our one and only sugar baby! Lately it’s been a struggle keeping her blood sugar levels up. But now it’s looking better and her doctor is even considering lowering her dose of diazoxide. 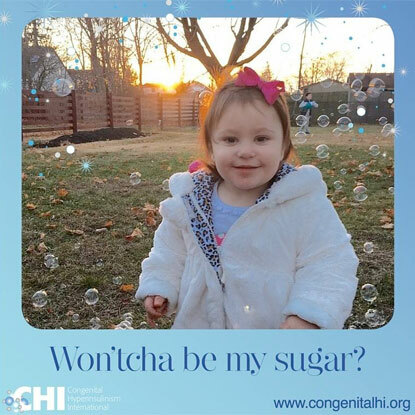 Joslyn is one very strong and determined little girl and we pray every day that she’ll outgrow her hyperinsulinism. I am Juliana Elizabeth, 20 months! I am still on this HI journey and my low sugar continues to be managed with Diazoxide. I continue to have my sugars checked daily and follow-ups at CHOP. I also have a few other medical issues that I am told don’t all relate to my HI … doctors say I am one of a kind … my parents say I am their perfect little girl! Most people think I am 2-3 years old between my long hair and how tall I am, but I am still only a year old! I like to do puzzles, color, run around and play with my older brother, Justin. I also LOVE “coco” (what I call chocolate), but that’s okay if I eat sweets because I am a Sugar Baby. It is important to continue to spread awareness of HI, the rare disease I and others have, as well to educate people to prevent the serious side effects it can cause if not properly diagnosed early on and treated. Kinley – my little sugar baby! It is believed that her hyperinsulinism is resolving, and she is thankfully now medicine free. However, lately it seems that maintaining her blood sugar at a safe level is a daily struggle. She is such a strong, beautiful and resilient little girl.